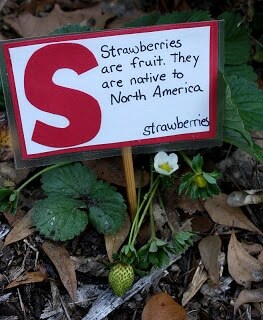 We went outside the other morning and saw that the first of our strawberries have begun blossoming!!! I just put these plants in the middle of our flower garden and they are doing well, but didn’t have a place marker or label to say what they are. Although it is obvious to even a 2 year old, I am trying not to just garden, but to use the garden as a resource to make learning real and connected. My 2 year old is learning his letters, so I wanted to make these the focus of the label. My 5 year old has begun reading, so I wanted to include simple sentences that use sight words and words that can teach her a vocabulary word or connect to a different subject matter. I am sure that you can guess all the amazing things we can talk about in just this strawberry marker; geography, writing conventions (when to capitalize a word), and food groups. 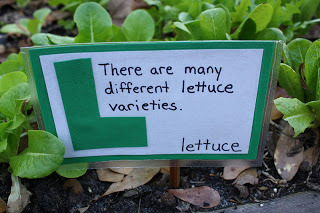 I have tried many different types of labels; premade, Popsicle sticks, cut up milk jugs, painted on sticks, rocks and more, but these are the quickest, easiest way to add more letters and words to your garden. They will not last forever, but should do for a year or two! I use contact paper, but if you have a laminator, that would work too. Just remember to leave a big space around the card so that water doesn’t leak in. 1. Make your card. Cut the contact paper double the size of your card plus space for the wide edges. 2. Make sure to leave 1/2 inch or more all the way around the edges. Seal. 4. Let your kids place the marker near the plant it describes! 5. Read it often! Words are just words unless you interact with them. What a great idea! I don't garden, but I wonder if my in-laws would let me do this to their garden since my kids like to help them! These are great! I love the way they look and the info you put on them. We did a sensory garden, incorporating elements to interest all your senses, but didn't mark some of the herbs well. I couldn't tell some of the varieties apart,especially some of the sages, after awhile. We'll have to do something like your markers this year! What a fabulous idea! I know what we will be doing this week for our garden. Both my two little ones love helping out in the garden. Thank you for the inspiration! Thanks all – we love them too! Brittney, I do hope your in-laws let you! Little Wonder Days, I am going to go back and check your blog to see if you have posted about your sensory garden. I have considered moving my herbs and adding more. Natalie – I am going to be reviewing some seeds in the next month and hoping to find some that are easy and fun for kids to grow. Melissa – I would love for you to send us a picture of your labels that you make with your kids – I'll post them on our From Our Readers page!! !